Arisa is your ordinary girl. A one in a million star, yet very ordinary. 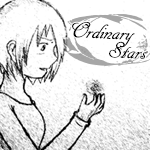 However, this ordinary star happens to find herself in the wrong place at the wrong time. Upon seeing the murder of an "innocent" life, her life changes forever. Soon Arisa finds herself meeting new faces that keep telling her her fate is now intertwined with theirs. Confused and distraught, she meets Kane, the only boy willing to go against his nature and slow down for her. What will happen to Arisa now that her fate is changed for eternity?